A client recently wanted to copy and paste hyperlinks with friendly descriptions from Excel in to the Hyperlink column of a list in SharePoint online. Another piece of functionality that is missing, is the ability to update list data from Excel. You can create a new list from an existing spreadsheet, you just can’t update an existing one. I tried a few obvious things, like using delimiters such as the following, without any luck. Thanks so much! Great post! I discovered an easier way to do this in SP 2013. Export your list to an excel spreadsheet. Put it on your desktop. Then go to site content (the place you want to import the list) and find the app “import spreadsheet”. Simply find your spreadsheet, and import it. Then modify the list view to include “Link Display Name” only, and you’re done. Took me seconds to migrate an extensive links list to a new site. Thanks for the comment JC, that certainly sounds quicker and simpler than going through Access like I did. The problem with this is if your SharePoint list already exists with a specific set of fields already defined in the list. Import Spreadsheet as mentioned in your comment is much like how Access will imports a table, and the problem with it is that it will create the SharePoint list and guess at the data type of the fields to create in the list based upon the data in the Excel file (or Access table). So, Daniel’s blog information is critical to know if you want to import Excel file with hyperlinks to an existing list by appending the data to the list. Here it is in 2017 with me using SharePoint in O365 to move 1,000’s of items from one list to another (i.e. migrate the list content) between site collections when I am not a site collection admin and cannot save or add the list as a template with data, and this blog post is a critical to understand how to make that process work. There is one piece of this puzzle that is missing. What if your Excel file has a column of hyperlinks far too large to manually edit all of them to get them into the needed format that Daniel explains? What we need is an automated way to convert them to the necessary format he describes. This seems to only be able to be done with a custom VBA macro. 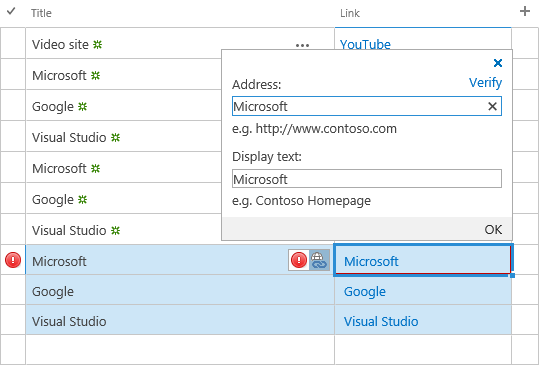 See this blog post: http://howtouseexcel.net/how-to-extract-a-url-from-a-hyperlink-on-excel. Thank you. Saved the day! Saved the day. The other excel ways didn’t work for me. Thank you! Awesome. You save the day for me. I appreciate bro.